Fusions are performed in patients with degenerative disk disease, spondylolysthesis, recurrent herniated disks, and spinal stenosis. Fusion is performed in these patients when conservative forms of treatment have failed. 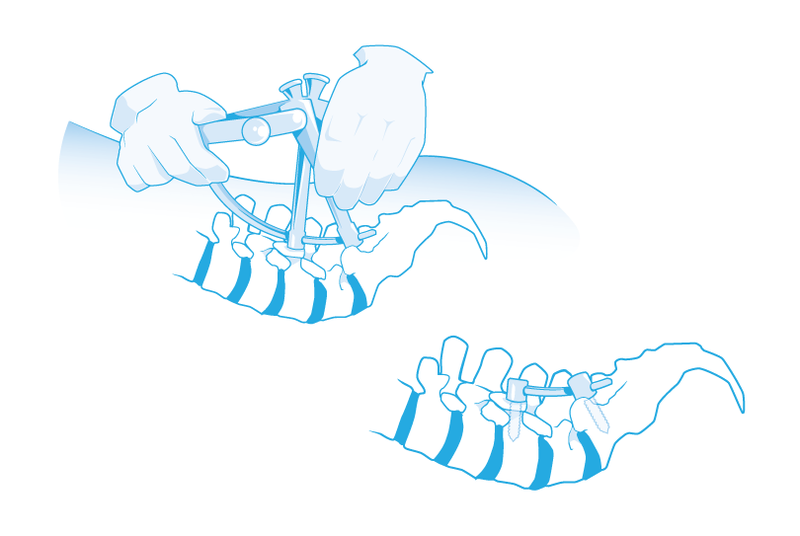 In fusion of the lumbar spine two or more vertebral segments are joined together, eliminating movement in the joints. The procedure is performed with the hope of reducing pain caused by movement and compression of the nerve roots. Pedicle screws have long been used to provide structural support to the spine allowing the joint space between the vertebral bodies to fuse. Screws are inserted into the pedicle of the vertebrae at the level above and below the disk space to be fused. A rod is then attached to solidly link both pedicle screws. During the placement of conventional pedicle screws a considerable amount of muscle must be cut and stripped away from the bone in order to insert the screws. This can result in a lengthy healing time and considerable post operative pain for the patient. Minimally invasive percutaneous pedicle screw and rod placement eliminates the need to perform much of this cutting and stripping of muscle. The percutaneous pedicle screw system (Medtronic’s Sextant is shown here) allows the screws and rods to be placed through small puncture wounds in the skin under x-ray fluoroscopic guidance. The Buffalo Neurosurgery Group performs pedicle screw lumbar procedures to provide structural support to the spine allowing the joint space between the vertebrae to fuse. Screws are inserted into the pedicle of the vertebrae at the level above and below the disk space to be fused. A rod is then attached to securely link both pedicle screws. The percutaneous pedicle screw system (Medtronic Sextant) allows the screws and rods to be placed through small puncture wounds in the skin. A considerable amount of muscle must be cut and stripped away from the bone to insert the screws. This can result in lengthier healing times and a considerable amount of post-op pain. Minimally invasive percutaneous pedicle screw and rod placement eliminates the need to cut and strip the muscle tissue. large amount of work? I am completely new to operating a blog but I do write in my diary daily. It's awesome designed for me to have a web site, which is useful for my know-how. In fact when someone doesn't know then its up to other viewers that they will assist, so here it takes place.